LUVERNE Truck Equipment, an American manufacturer of truck, commercial van and SUV accessories since 1963, has released a new heavy-duty replacement truck bumper: the Journeyman™ HD. This American-made bumper features a one-piece construction, an industry-leading finish and a tested 30K straight-line pull rating, making it one of the strongest replacement bumpers in the truck accessories market. 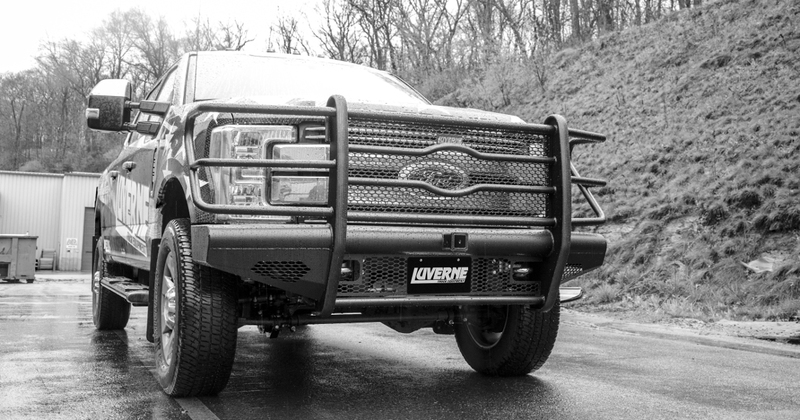 The The Journeyman™ is a bumper and brush guard combination. It is built from 10-gauge steel and schedule-40 pipe, welded together into a one-piece design. ™ is a bumper and brush guard combination. It is built from 10-gauge steel and schedule-40 pipe, welded together into a one-piece design. This not only adds maximum strength to the front end of the truck but also provides a solid foundation for the welded 2″ x 2″ receiver tube. The standard 2″ receiver tube has been tested at our Detroit engineering facility to ensure safety and a dependable straight-line pull rating of 30,000 lbs. With the right tow hook, ball mount or other hitch-mounted accessory installed, the Journeyman™ makes any big truck ready to tackle big jobs. Another critical feature of the Journeyman™ is its industry-leading dual-layer finish. The bottom layer is a rust-resistant zinc primer to protect the steel frame. The top layer is a highly durable textured black powder coat that maximizes rust protection and easily resists scratching and chipping. The Journeyman™ is also uniquely equipped with protective rubber facings on the vertical uprights – a feature that competitor models do not offer. To finish off this hardworking, heavy-duty replacement bumper, it features a punched steel screen and the LUVERNE signature logo reveal. The steel screen keeps sticks, stones and other road debris out of the truck’s grille, and it can be removed on certain models, if necessary, to avoid interference with forward-facing cameras or sensors. 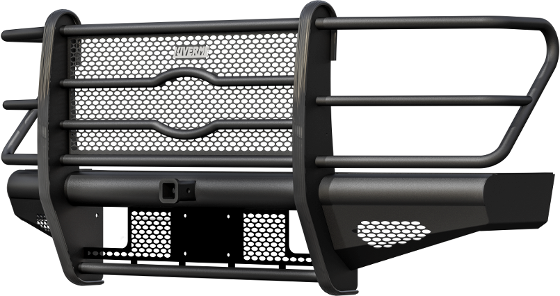 The signature vehicle logo reveal adds even more protection for the grille and shows off the vehicle’s emblem with pride. All Journeyman™ HD replacement bumpers are made with a vehicle-specific design for no drilling necessary, and all are made right here in the USA. They are currently available for the Ford Super Duty F250, F350, F450 and F550 with more vehicle applications coming soon. We also offer a two-pack version to reduce shipping costs and keep prices lower for our dealers and their customers. For more information on this product and more, visit www.luvernetruck.com. About LUVERNE: LUVERNE Truck Equipment, a CURT Group brand, has been manufacturing quality automotive accessories in the United States since 1963. Our brand is nationally known and respected. We offer a broad base of quality, functional aftermarket accessories for pickup trucks, commercial vans and SUVs. We specialize in American-made grille guards, running boards and side steps, and our products are primarily made from high-quality stainless steel, aluminum and mild steel.